This combination cigarette case and lighter is a Ronson Pal. The Pal model was first manufactured in 1941 and is Ronson catalog number 7070. 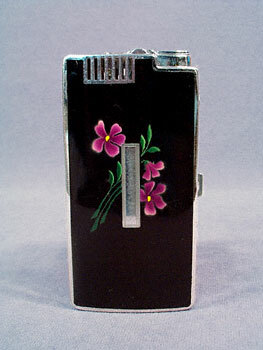 It is finished in black enamel front and back, with flowers adorning the front panel. Holding 10 non-filter cigarettes, it has a built in cigarette lighter in the top, and is 4-1/8" tall, 2" wide, and 3/4" deep. The inside spring clip which keeps the cigarettes in place is good and strong. This piece has mild scuffing consistent with its age, but shows no major scratches, dents or other cosmetic problems, and has an unused initial plate. This lighter works great, and will be shipped with a flint and without fluid. Please do not store this lighter with the flint though, as it will deteriorate and become impacted over time.